Dr. Richard Miller received the Ph.D. in biological oceanography from North Carolina State University in 1984. He is currently the Chief Scientist at the National Aeronautics and Space Administration (NASA) at the Stennis Space Center. His research interests include the role that river-dominated coastal margins play in the global cycling of materials including carbon. He is involved in developing field instruments and computational technologies for the application of remote sensing to coastal environments. He has co-authored more than 80 papers in international journals and conferences. Dr. Carlos Del Castillo received his Ph.D. in Oceanography from the Department of Marine Science, University of South Florida. In his dissertation work he described the optical properties of Colored Dissolved Organic Matter in waters of the Eastern Caribbean, Gulf of Mexico and the Arabian Sea. Current research interest include how changes in chemical composition of Colored Dissolved Organic Matter affect optical properties of water, and the use of remote sensing to study transport of organic carbon by river plumes. Dr. Del Castillo is a researcher at NASA Stennis Space Center. Brent McKee is a graduate of the University of North Carolina-Chapel Hill with a Ph.D. from North Carolina State University. He is currently a Full Professor at Tulane University. List of Contributors. Preface. Ch 1 - Introduction to Radiative Transfer - J. Ronald V. Zaneveld, Michael J. Twardowski, Andrew Barnard and Marlon R. Lewis. Ch 2 - An Introduction to Satellite Sensors, Observations and Techniques - Christopher W. Brown, Laurence N. Connor, John L. Lillibridge, Nicholas R. Nalli and Richard V. Legeckis. Ch 3 - Optical Airborne Remote Sensing - Jeffrey S. Myers and Richard L. Miller. Ch 4 - In-Water Instrumentation and Platforms for Ocean Color remote Sensing Applications - Michael J. Twardowski, Marlon R. Lewis, Andrew Barnard and J. Ronald V. Zaneveld. Ch 5 - The Color of the Coastal Ocean and Applications in the Solution of Research and Management Problems - Frank E. Muller-Karger, Chuanmin HU, Serge Andréfouët, Ramón Varela, and Robert Thunell. Ch 6 - Bio-Optical Properties of Coastal Waters - Eurico J. DSa and Richard L. Miller. 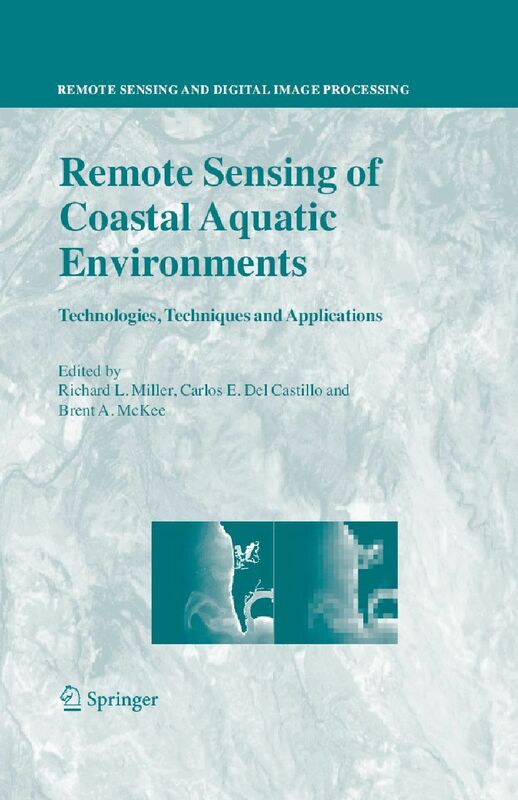 Ch 7 - Remote Sensing of Organic Matter in Coastal Waters - Carlos E. Del Castillo. Ch 8 - Hyperspectral Remote Sensing - Zhongping Lee and Kendall L. Carder. Ch 9 - Computational Intelligence and Its Application in Remote Sensing - Habtom Ressom, Richard L. Miller, Padma Natarjan, and Wayne H. Slade. Ch 10 - Modeling and Data Assimilation - John R. Moisan, Arthur J. Miller, Emanuelle Di Lorenzo, and John Wilkin. Ch 11 - Monitoring Bottom Sediment Resuspension and Suspended Sediments in Shallow Coastal Waters - Richard L. Miller, Brent A. McKee, and Eurico J. DSa. Ch 12 - Remote Sensing of Harmful Algal Blooms - Richard P. Stumpf and Michelle C. Tomlinson. Ch 13 - Multi-Scale Remote Sensing of Coral Reefs - Serge Andréfouët, Eric J. Hochberg, Christophe Chevillon, Frank E. Muller-Karger, John C. Brock, and Chuanmin Hu. 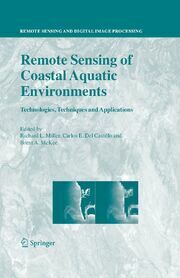 Ch 14 - Real-Time Use of Ocean Color Remote Sensing for Coastal Monitoring - Robert A. Arnone and Arthur Parsons.